Low friction nylon split collars for operation in harsh chemical and high heat conditions. 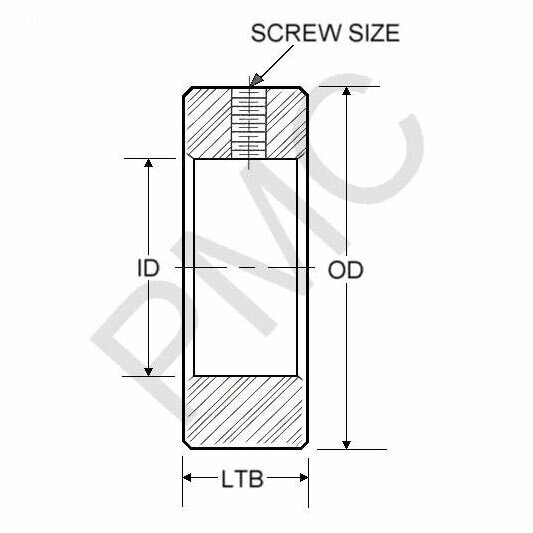 Length Through Bore Choose an option3/8"1/2"9/16"5/8"3/4"15/16"1 1/8"
Outer Diameter Choose an option1"1 1/4"1 3/8"1 5/8"1 3/4"2"2 1/8"2 5/16"2 3/8"2 1/2"2 5/8"3"3 1/8"3 1/4"3 3/8"3 5/8"4 1/8"4 3/8"4 1/2"4 3/4"5"5 1/4"5 1/2"
Shaft collars are a vital component found in most power transmission applications. Nylon split clamp collars from Plastic Machining Company provide many benefits over metals and other comparable materials, including an extremely low coefficient of friction, cost-effectiveness, and the ability to operate in harsh chemical and high heat conditions. Our split clamp collar design comes with two stainless steel set screws for easy removal and installation. Plastic Machining Company utilizes only state-of-the art CNC machining. Every collar is hand crafted, finished and inspected. Even ordered by the thousands, you are guaranteed that every collar and shaft collar is hand inspected before it leaves the facility. 3/8", 7/16", 1/2", 9/16", 5/8", 11/16", 3/4", 13/16", 7/8", 15/16", 1", 1 1/8"
3/4", 7/8", 1", 1 1/8", 1 1/4", 1 3/8", 1 1/2", 1 5/8", 1 3/4", 2", 2 1/8", 2 5/16", 2 1/4", 2 3/8", 2 1/2", 2 5/8", 2 3/4", 3", 3 1/8", 3 1/4", 3 3/8", 3 1/2", 3 5/8", 3 3/4", 4 1/8", 4 1/4", 4 3/8", 4 1/2", 4 3/4", 5", 5 1/4", 5 1/2"
1/4", 5/16", 3/8", 7/16", 1/2", 9/16", 5/8", 3/4", 7/8", 1", 1 3/16", 1 1/4", 1 3/8", 1 7/16", 1 1/2", 1 5/8", 1 3/4", 1 7/8", 1 15/16", 2", 2 3/16, 2 1/4", 2 1/2", 2 3/4", 3", 3 1/4", 3 1/2", 3 3/4", 4"